This is Part 3 in a 3 part series on how to build your self esteem by learning to stop needing approval. The following are some of the most common habits you may use to seek approval from others. Once you're aware of what you're doing, it's then just a matter of changing your behaviour. When you walk into a room full of people, what’s the first thing you do? Is it to size everyone up and think, “Oh, she looks mean” or “He’d never talk to me” or “That’s the popular group, better not make eye contact with any of them”. If you are, then you're trying to judge people before they can judge you. You’ve probably heard sayings like, “You have 10 seconds for someone to make up their mind about you” and “You need to impress people to get them to like you.” By thinking this way, you put a lot of unneeded stress on yourself. Also, think to a time when you first met someone and you knew they were trying so hard to get you to like them. Most likely, it put you off because they were trying too hard. You would have liked to have them just be themselves, to relax, and be natural. Or it may make you feel suspicious about them as in why are they trying so hard? Do you see what I mean? If you try to impress people, most likely you won’t. If you relax and just be yourself, you will impress people. Trying to impress others also means that you miss out on a lot. You won't hear large parts of conversations because you tune the other person out while you try to think of something clever or witty to say or think about what story you know which will beat their tale. You'll be so intent on your own image that you don't simply enjoy the conversation or hear what that person has to say or even get to know that other person. You become so focused on yourself that nothing else matters. For your efforts to gain approval, all you'll end up with is feeling empty and insecure. You’ll probably rerun the event over and over in your head thinking you weren’t good enough. If you hadn’t worried about impressing others but rather concentrated on the moment, you might have made a new friend, or learned something valuable, or just had a good laugh about something. You would then have good memories of the event instead of beating yourself up over it. You may feel you don’t have someone’s approval when really you do. The other person just hasn’t said anything or you may be reading something into the situation that isn’t there. The temptation might be to start thinking about what ulterior motives they have for what they say. For example, if someone gives you a compliment, you may also be adding your own story to it. You may think, “They’re only being nice to me because they feel sorry for me.” Let your life story go and just listen to people and what they say literally. Don’t add your own beliefs to it. What you think and what you choose to spend your time thinking about is completely your own business. What someone else thinks is their own business. You wouldn’t want someone else telling you what to think, so why do you try to control other people’s opinion of you? They’re allowed to think whatever they want. That’s their right. Just as it’s your right to have your opinion. So, don’t worry about what others think, just respect their opinion. You don't have to agree with it, just respect that they're entitled to their own thoughts. Instead, ask yourself, “Is this something I approve of myself for doing?” It’s your opinion which matters the most. If you’re busy thinking what someone else should be doing, then you’re not paying attention to your own business. As soon as you say things like, “He should spend more time with me”, “She should appreciate what I’ve done for her”, or “He should get a better job”, you are not minding your own business. Life is just so much easier if you just concentrate on what you need to do. Other people can take care of their own lives. You just need to focus on your own. So, the next time you start thinking, "He should listen to me", tell yourself, to mind your own business and then ask yourself, "What should I be doing?". In this case, the answer most likely will be something like, "I should be listening to me." It's actually quite interesting in that often the advice you give to others, is really the advice you should be giving to yourself. You may also be distracting yourself from dealing with your own issues by focusing on what you think needs to be fixed in someone else's life. You ignore your own needs. Focus on your own life. Pay attention to what it is that you want and what you need. By doing this, you will gain approval from others because you know what you want. People respect those that know what they want. What if they don’t approve of you? Do you really need this person’s approval? Will you stop breathing and die if you don’t get it? Of course not. You may be putting too much emphasis on someone else's opinion. It really doesn’t matter what they think as long as you’re happy with what you’ve done. If you find that you’re afraid of saying something because you’re worried people will think your comment is stupid, well stop thinking about yourself. Think about the situation. Be in the present moment. What are they discussing? Focus on that. Do you make excuses or apologies in order to defend yourself or give a better opinion of yourself? Even though we think that being polite is about being considerate of others, many times it's about trying to create a better impression of yourself. It's not your fault the document isn't finished or that you were late or that you forgot to pick someone up. Usually, it's all an attempt to manage your self image. Pay attention to what excuses you're providing and then ask yourself why you feel the need to do this. Once you understand that searching for approval in others is really a clue to what you need to give yourself, you'll feel an overwhelming sense of relief. You can now simply enjoy conversations with others without stressing yourself out trying to think of something clever or witty to say. You won’t interrupt people and will calmly let them finish their sentences, you won’t be tuning out, you won’t be apologizing or making excuses for your actions. This will all instantly disappear because you no longer need approval from others. 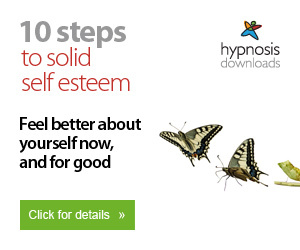 Your self esteem will rise instantly by leaps and bounds. Your whole life will be completely different. So, let it go and just know, YOU DON’T NEED anyone else's approval because you approve of you. And, that's one of the biggest secrets to enjoying life. Give yourself what you need and you will get it from others. 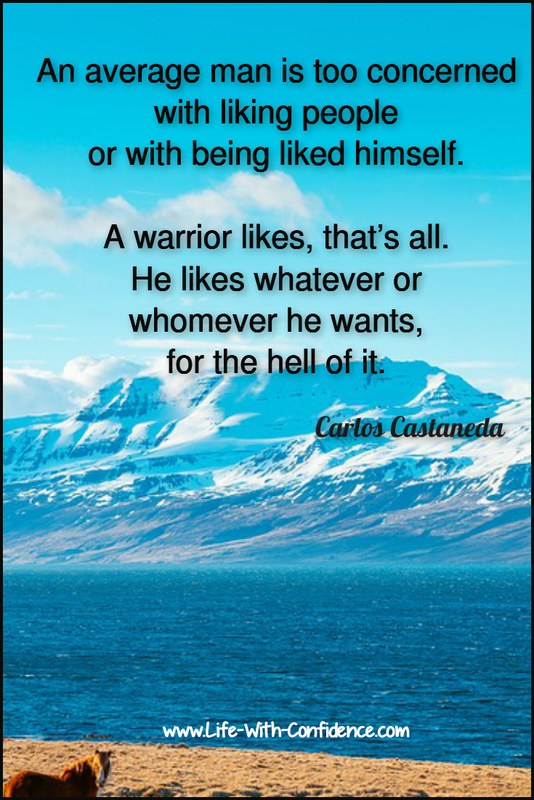 This series of articles on approval seeking is based on my book, "How Do I Stop Caring What People Think Of Me?". 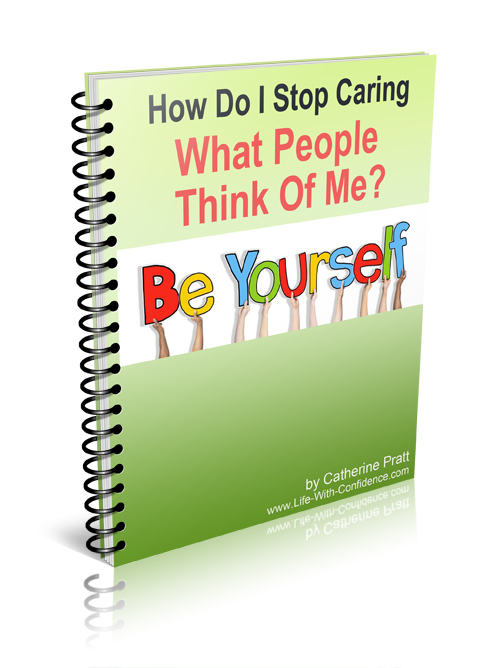 In this book I provide everything you need to know to stop seeking approval from others. 130 pages. It's an ebook you download to your computer so you can be reading the solutions to your problem within minutes. You're also going to love this ebook. In here, you'll learn how to deal with conflict (and still be a nice person) and how to say No (and not hurt anyone's feelings) as well as how to ask for help so people really do help you. It's set up so you can take one powerful tip a day and start implementing it into your life. After ten days, you've dramatically changed how you feel about yourself and you'll no longer be taken advantage of by all those who know you. It's an instant PDF download. For $3.99, it's a steal for how much info you get. If you're an approval seeker, you'll most likely relate to the people in this Byron Katie video and what they say happens when they search for approval in others. It gives you some additional motivation on why you want to stop seeking approval from others. Back to top of "Break Approval Seeking Habits"
or Have a visual reminder of how to stop needing approval. These are two fantastic books on how to work through your thoughts and see how you really don't need any one else's approval. Just your own. In 1968, Leonard Nimoy (better known as Spock in the Star Trek series) responded to a fan who wanted to know how he handled not fitting in. Some of the gems from this letter are, "But it was only the need for popularity that was ruining his happiness. The question was which was more important, was being 'popular' with the pack who might turn on him any minute or being true to himself?" Read the full article here or on My Star Trek Scrapbook.